THE best stories can be transferred into any cultural context and still have an effect. The most obvious example is Romeo and Juliet, which was uprooted from 14th-century Italy, transplanted into a blue-collar neighbourhood in 1950s New York City and renamed West Side Story. The same can be said of Willy Russell’s BLOOD BROTHERS: the long-running West End musical has been given a fresh coat of South African paint by musical genius David Kramer — and the result is sheer stage dynamite. Willy Russell and David Kramer, take a bow — for Blood Brothers is extraordinary theatre of the highest order. 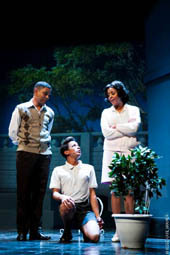 Russell’s Olivier Award-winning original was set in working-class Liverpool between the 1950s and 1970s, and he granted Kramer permission to adapt it to reflect coloured life in District Six and the Cape Flats during a similar era — the first time he has allowed his musical to be localised. The beauty of the South African version is that its politics are not overt, but rather subtly implied in the universal human story of a single mother who is forced to make an agonising decision while battling to make ends meet. Blood Brothers, showing at Pieter Toerien’s Montecasino Theatre in Fourways until January 5 before moving to the Fugard Theatre in Cape Town from February 12, tells a moving story of twins separated at birth that will beguile you while it slowly breaks your heart. In adapting and directing it, Kramer (himself an Olivier Award-winner for Kat and the Kings) has not fiddled much with the story; it’s the language and lyrics that have been imbued with an authentically South African flavour, and the music and arrangements that have been made even lekkerder. Bianca le Grange, one of the standout contestants from the first season of SA’s Idols, mesmerises with a performance brimming with pathos and conviction. She has already proved her musical theatre chops in two of Janice Honeyman’s jolly pantomimes, but in Blood Brothers she shows that she can inhabit a complex, unglamorous character with panache. She plays Mrs Johnstone, a single mother whose initial stellar promise and subsequent tragic decline is compared in song to the life of Marilyn Monroe. Abandoned by her husband and saddled with seven children at the age of 25, when she discovers she’s pregnant again — with twins — she clutches at the only straw available to her: giving one of the boys to her upper-crust employer to raise. So Edward (Dean Balie) is brought up as a cosseted little boy, oblivious to the fact that he has a twin brother, the rough-and-tumble rapscallion Mickey (Ephraim Gordon), living on the seedier side of town. The two lads inevitably meet and become fast friends, much to the horror of Edward’s nervy adoptive mother, Mrs Lyons (Buhle Ngaba), and the dismay of Mrs Johnstone, who remains guilt-ridden over having, in essence, "sold" her own child. Even though the families conspire to cleave the boys apart, they somehow keep finding each other. But real life starts intruding on their teenage idyll when a girl, Linda (Andréa Frankson), enters the picture. And in adulthood, the schisms between their two worlds — one of opportunity and privilege, the other of economic hardship, poverty and crime — become even more pronounced. 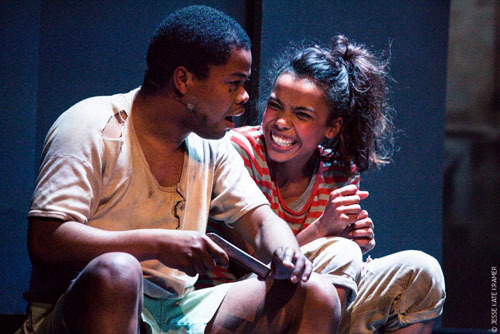 The musical portrays how two individuals who share the same genetic material are set on contrasting life paths by differences in nurture, environment and upbringing — something that is still painfully evident in the South Africa of today. Courtesy of the omnipresent narrator (Elton Landrew), elements of superstition and ominous portents are threaded throughout the show as constant reminders of impending doom amid all the jollity — including the notion that the "tokoloshe is going to get you". This production is outstanding: from the acting to the era-evoking digital projections in the place of physical sets. It is a soul-wrenching social tragedy that is likely to leave you blubbering, yet feeling enriched for having experienced something truly special. You’ll want to see it again and again, just to relive the roller-coaster ride of tumbling emotions, multidimensional characters, superbly crafted music and a story that is so hauntingly compelling that it will remain with you long after you’ve stepped out of the theatre. The smash hit musical by Willy Russell, which was the third longest running play on London's West End, has made its triumphant debut in Cape Town. For the first time ever, Willy Russell has allowed an adaptation of the original story, moving it from a setting in Liverpool to one in Cape Town, thanks to some masterful persuasion from renowned South African director David Kramer. A Greek tragedy of a play, Blood Brothers is the story of twin boys, Mickey (Ephraim Gordan) and Edward (Dean Balie) whose impoverished mother, unable to provide for them both, makes the heartbreaking decision to give one of them away. Shot through with superstitions, the story tells how fate conspires to bring the boys back together with terrible consequences. All the actors of this relatively small cast do a great job in creating the energy and raw emotion of this doomed tale. Gordan and Balie in particular portray the twins, at the boisterous age of 7, with childish mannerisms and a playfulness that, rather than sliding towards silliness, instead serves to highlight the sweetness in their relationship. As the boys grow up Gordan’s portrayal of Mickey as a young and troubled man wins the audience’s empathy with ease, regardless of his brimming raw anger that is the root of the sadness in the story. Bianca le Grange as Mrs Johnstone brings an almost alarming familiarity to her portrayal as a woman living on the Cape Flats. With her powerful voice and vivid emotions, she inspires a sense of deep pathos for her and her sons. The play’s sadness is coupled with an ominous inevitability carried by the narrator, Elton Landrew. Buhle Ngaba as Mrs Lyons also aids the tension in the play, with taut expressions and an uptight body language as she obsesses about keeping her adopted son a secret. The music, as with any other play touched by David Kramer, has its own distinctly emotive sound and has been adapted by musical supervisor Alistair Izobell to suit the Capetonian setting with, for example, a switch from references to ‘the Devil’ to ‘the Tokoloshe’. A fairly simple stage set allows the storyline, the music and the actors’ abilities to take precedence in the play, while transitions between scenes and settings are smoothly done with a creative use of projections against the backdrop of the stage. Even the costumes share the same simple design and monochromatic colour scheme as the set, with just occasional splashes of red hinting at blood links, and blood let. 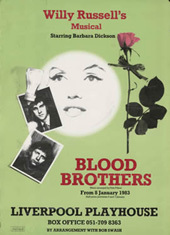 With Blood Brothers, David Kramer has added yet another heartfelt story to his long list of impressive works. There are, inevitably, echoes of his hits District Six and Kat and the Kings , not least as he clearly had many of those cast members lining up to work with him again. No doubt they, like us, understood that the combination of Willy Russell and David Kramer was bound to be a sure fire hit. David Kramer has a well developed sense of hit potential . His latest initiative, namely the British Willy Russell 's popular musical Blood Brothers to relocate to Liverpool in England to Cape context, arises precisely out. And, as the opening night of Blood Brothers is any indication, he was again on target. Blood Brothers has a high set of technical requirements ( there are 79 scene changes ), but Kramer has overcome most with a filmic approach. As for the language, he used his District Six recipe. The story is mostly in English but with a strong African flavor. English is also used for indicating class difference. 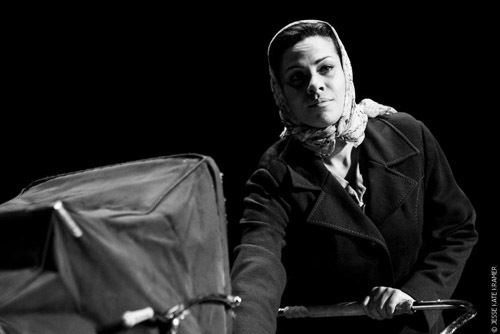 The anchor of Blood Brothers is Evelyn Johnstone ( Bianca le Grange ), a woman of District Six which due to economic considerations and in secret gives one of her newborn twin boys to her employer, Jennifer Lyons ( Buhle Ngaba ), who is barren. That the story will have a tragic end, as we have heard in the prologue. Le Grange 's powerful voice and wide register come fully into its own . Her theme song, " Marilyn Monroe " becomes a refrain that stays long afterwards in your head, and her emotional investment in the character is amazing. Ngaba does not always make the grade in terms of game, and it does sometimes detract from the tension to be established. The twins, Eddie ( Dean Bar ) and Mickey ( Ephraim Gordon ), are depicted seven years to mature men. That takes a lot, but both Bar and Gordon pass with flying colours. They boy’s games are comical and dear, especially his tricycle Desk. They managed the transition to adults and bitter opponents equally convincing. Andrea Frankson as their girl-friend Linda is extremely versatile and immediately hits the eye while Marlo Minaar's natural and intelligent game in a couple of roles makes the heart warm. Full praise should go to Elton Landrew as the narrator, the most substantive character alongside those of Mrs. Johnstone. Landrew's game is instinctive and organic, but always precise and thoughtful. He does indeed his Fleur du Cap Award for best actor honour. It makes a sad story and beautiful melodies interpreted by an accomplished ensemble. One would predict that this version will go far from here on the boards.